Not much in the way of progression so far. Our Tuesday involved getting down 4/5 Hyjal and on Thursday we cleaned up Shade of Akama in under 3 hours. This means Sunday will be a real progression night and a test to see if we have that guy in the raid or not. I sincerely hope not. But I will have the cameras running for the Carnage highlight reel. And shout outs to that Warlock who messaged me the other day to pick off a White Remedy Cape (I think) off of me as well as to the Druid who I partied with in doing Heroic Slave Pens. I forgot your guys’ names but thanks for reading. You’re like the only two players I know of on Ner’Zuhl who read my blog. Other then my Guildies of course. I’ve somehow attracted the attention of Blori, the worst warrior on the server. I’ll have to watch what I write more carefully. Interested in getting some new themes for your WordPress blog? I’m running a give away courtesy of WPDesigner. Check out this post for more details and bring your RP skills. My 5 part series for this month looks at the problems that new raid healers may come across. I couldn’t find any victims last week. But this week, I found one! Nightravyn, one of the lurkers on the BA chatroom, sat on the hot seat. Too Many Annas – Most of this blogger’s characters start with An. I haven’t come across many blogging Shamans yet. There are some notable ones out there, of course. But a Resto one is rare. Then again, maybe I’m not searching hard enough. 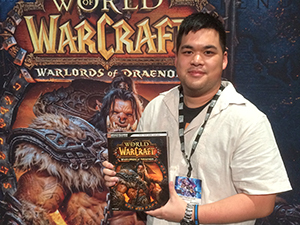 Matt likes: Raiding and the Resto Shaman. What? You mean there’s more to healing as a Resto Shaman then spamming brain heal? If you’re a GM looking to get started on raiding, then these numbers might be something that you will be interested in. Almost 25% don’t seem to be at the point where they are actively raiding. Almost 20% of those polled raid over 15 hours a week. However, the largest raiding populations raid between 5 – 15 hours per week. These are pretty standard hours for most players who have to go to work or attend school. That’s the kind of length that they’re willing to commit to in terms of purely raiding. It does not include their time spent farming, running instances, or the like. So be sure to keep this in mind when you are planning out your raiding schedule for the week. Is it representative of the entire WoW community? Unlikely. But it’s a good start. If you’re a casual Guild that wants to try it out, start out small and aim for about 6ish hours. If they can handle it, then go ahead and ramp it up slightly.